Twenty-five years ago, Rink Dickinson, Michael Rozyne and I founded Equal Exchange, an idealistic company that aimed to revitalize the food experience for US eaters. We envisioned a company that would help birth a movement and enable people to know where their food came from, who grew it and under what conditions it was produced.More has been accomplished than we ever imagined possible. Today, there are hundreds of companies devoted to what is now called fair trade, including some of the biggest brands in the world. Yet, we are not finished. I am reminded frequently that what we have ended up with is what I might call “less unfair trade.”Fair trade is often presented as a recent invention that will solve many of the world’s problems instead of more accurately as a tool that has evolved over thousands of years. The notion of fairness in trade and community has a long history. The Torah and Christian Bible, the Koran, Hindu and Vedic texts, the writings of the Buddha, and many indigenous traditions offer ethical guidelines for trade and supporting the poor and less fortunate among us. In the United States, one early forerunner of what we call fair trade was the Free Produce Movement. Started in England, it was promoted by Quaker abolitionists in the 1800s as a way to end slavery by eliminating markets for items produced by slaves. More recently, after the end of the Second World War, faith-based organizations began importing goods produced by refugees, artisans and communities deemed poor or disadvantaged. In subsequent decades, nonprofit organizations and principled small companies working in solidarity with social movements, liberation struggles and socialist countries expanded this type of trade. Most of these efforts were small and outside of mainstream trade, using alternative distribution methods to move goods from their producers to their final consumers. Then, in the 1980s, spurred by a lack of access to sufficient markets, a group of indigenous coffee farmers in Mexico decided to find a way to overcome the limited possibilities of the alternative traders and gain better access to important markets in Europe. A Dutch priest, who worked with the farmers, joined with a Dutch nonprofit leader to create the first fair trade certification. Inviting larger companies to commercially distribute ethically sourced products transformed the niche practice of alternative trade into the widespread phenomenon of fair trade, with a resulting rapid rise in awareness and sales. There has, however, been a downside to this success. Where once alternative trade was ethical from initial production through distribution to final purchase, it was now mixed with commercial trade. Fair trade products were clearly certified, but whether .1% or 100% of a company’s sales were fair trade, the company could still promote themselves as a fair trade company. Thus, a whole product line could benefit from the halo effect of having one or two fair trade products, and consumers had no way to tell how dedicated a company was to fair trade. As fair trade certification became more prominent, pressure for more rigorous certification also increased. Producers had to start paying for certification that was largely controlled in Europe. There was little public conversation about this changing power dynamic between poor producers of color and wealthier, mostly white buyers and activists. We had no tools for discussing issues of power and trade in relation to race, class, gender, sexual orientation, language, or education. It was as if we imagined that fair trade had vanquished colonialism and unequal exchange and brought about global justice and equality. In reality, however, the lack of conversation about basic trade relationships, coupled with the rigorous examination of farmers, but not companies or buyers, condoned a major unevenness in the trade system. Although it was far better than conventional trade, it was not fair. While we implemented the term fair trade to help promote healthier trade relationships, the term itself implied that those relationships existed, that we had achieved a just trade system. In fact, while fair trade, as it is currently constituted, has delivered great benefits, a closer look suggests that it could more accurately be called “less unfair trade.” For example, if we compared the average fair trade farmer’s standard of living to that of the average fair trade coffee drinker, we would find a huge disparity. Many farmers still struggle to meet their families’ basic needs, while U.S. fair trade coffee drinkers often struggle with having too much rather than not enough. 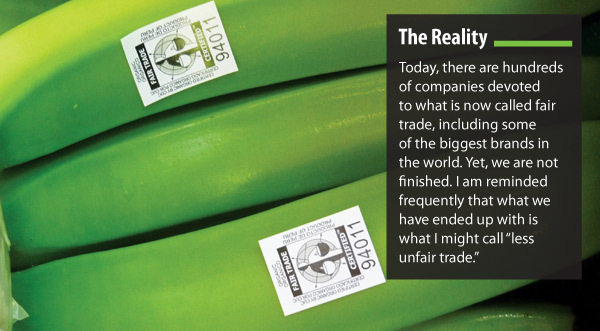 To better understand the limits of fair trade, let’s put it in context. In 1925, a new car cost around $290 or about eleven 132-pound sacks of unroasted coffee. In 2011, an average new car cost around $20,000, equivalent to about 60 sacks of coffee. If those trends continue, in another 85 years, a car will require over 300 sacks of green coffee. Farmers, with or without fair trade, are losing ground if they remain dependent on basic commodities. Fair trade or organic premiums in the long run are not enough to create healthy communities. This longer term framework helps us see that fair trade is not the sole answer to exploitative trade systems, but rather a tool to help us make traditional trade relationships less harmful and, at times, to change the game altogether. Through fair trade, we do see a change, as trade becomes less environmentally and socially destructive, and, sometimes, even healing for farmers, families and communities. Fair trade often provides a platform for building capacity in communities so that they can have more control over creating a better future. Still, we must face the limitations of our efforts. The rise of fair trade over the past decade to increasingly mainstream status in numerous countries has not been accompanied by a rise in conversations about the long-term impact of trade. Without that dialog, we can still convince ourselves that we already have the answer; we don’t have to look at how much we have gained from unfair trade and what changes still need to be made, not just in faraway farms, but inside ourselves, in our own families, communities, culture and countries. When we try to help “others” without including ourselves in the picture, we perpetuate the invisibility of power, especially institutional power dynamics, and we become complicit in keeping the status quo intact. The US tradition of pretending that the wounds of slavery and the extermination of native people are healed keeps us silent. It appears that the fair trade movement lacks an analysis of systemic oppression. We focus on changing contracts and tweaking the terms of trade without engaging in the deeper conversations about structural and institutional power that would give us the capacity to work toward truly “fair” trade between healthy communities. One reason these conversations about power are so difficult is that fair traders face the challenge of being inside an unfair market while trying to transform it. This balancing act is so demanding that even deeply committed fair traders have little time or space for big picture, often uncomfortable conversations about power that would make a complex undertaking even more challenging. Others have chosen to get past this limitation by accepting lesser incremental change that promises big scale with large corporations. These fair traders have chosen to use lower social standards, value quantity over quality and use traditional business approaches such as secretive decision-making to give them maximum flexibility. This has created mistrust with activists, farmers’ organizations and even some corporations who aren’t sure of the motives or accountability of these fair traders. Farmers and their organizations and networks, on the other hand approach the competing demands of trade and social change with a practical eye. They try to maintain multiple market channels at the same time as they work steadily to gain more expertise in the marketplace along with more voice in and, ultimately, more control of their trading relationships. A few are even buying or building their own consumer brands (e.g. Divine Chocolate) so they can learn more about the consumer marketing end of the supply chain, where most of the money in trade is captured. While these experiments are small, they are concrete steps toward equalizing trade relationships. This may seem like a sobering critique. What, you may ask, can we do about it Just as we did with Equal Exchange, we can all start small and dream big. We can start conversations about power and systems of oppression in our own organizations and networks. As we learn how to do this better over time, we can change the ways we interact with each other and with people across the globe. If we believe that fair trade is not just about helping poor producers but about learning, unlearning and helping ourselves too, then we can push fair trade to move beyond less unfair trade—in our lifetimes and for future generations—into more and more satisfying fair trade. I very much agree that while free trade is a step in the right direction, it is not the solution to all of the problems countries face when trading with one and another. The example given about the price of a new car compared to a bag of coffee does put into perspective that many farmers are in trouble.